Indian society is passing through modernism and conservatism. Some people do not consider living in these relationships, then some people still do not let boys and girls get in the name of 'Sanskar'. Some people marry only because there will come food and work at home, who will wear vermilion and mangalsula. The story of the people standing at these two opposite ends of the society is shown in 'Lukka Chupi'. Guddu (Karthik Aryan) and Rashmi (masterpiece Senan) who live in Mathura want to live in the relationship. They go live from Gwalior to their city and do not tell anyone about it. Guddu's family knows that Guddu and Rashmi have married and have got married and they reach Gwalior. Guddu and Rashmi do not have the courage to speak the truth, because Rashmi's father is the "protector of culture" and their people blacks the girls' face in the daytime. Guddu and Rashmi accept their marriage as accepting their marriage, but somewhere they both feel that they are cheating the people and living among them are in the living room. The idea of ​​a story written by Roshan Shankar is good, but to finish the story, he did not come properly. So, by wearing comedy clothes, he finished the conversation in some way, but the comedy became so powerful that it did not come in the mind of the audience and he had a lot of fun. The manner in which the story started in bold style is not seen at the end of the boldness film. Many scenes of the film have become very long, especially in the first half. There are some scenes like Kartik and Rashmi's channel scene, both of which are found out, which have been dragged unnecessarily. Likewise, some seers are victims of repetition, for instance, to depict neighboring women repeatedly in the house of Rashmi-Guddu, to try to marry Rashmi and Guddu. Rashmi and Guddu seem to like each other when they wake up and the film demands a halt here. The good thing is that it lacks its strength on the film's weakness. There are many funny scenes in the movie that make you laugh. Concerns about the marriage of Guddu's elder brother, humorous scenes of Guddu's friend Abbas, two sons of Guddu's elder brother, the scenes they come in, the scenes have become great. Through these, entertainment is rich. In the second half the film is good and lasts constantly. Especially in the last few minutes the film gets elevated. Director Laxman Utekar has done a good job with his cast. In the first half, he could not hide the shortcomings, but in the second half he has been able to make the audience laugh and bind. Supporting cast on the lead actors of the film is heavy. 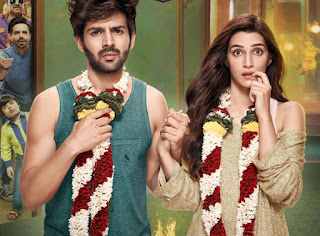 Kartik Aryan will have to increase his acting range. There is also a glimpse of Akshay Kumar. The same thing can be said for master senan. Deepika Padukone has a hangover on her. Oprah Shakti Khurana has made such faces that it is difficult to stop laughing. Pankaj Tripathi also laughs at the audience as a lame man. The performances of all other actors, including Vinay Pathak, are excellent. Some songs in the film are fine and some songs worth fast fast. Despite the shortcomings, Luka entertains hidden audiences.